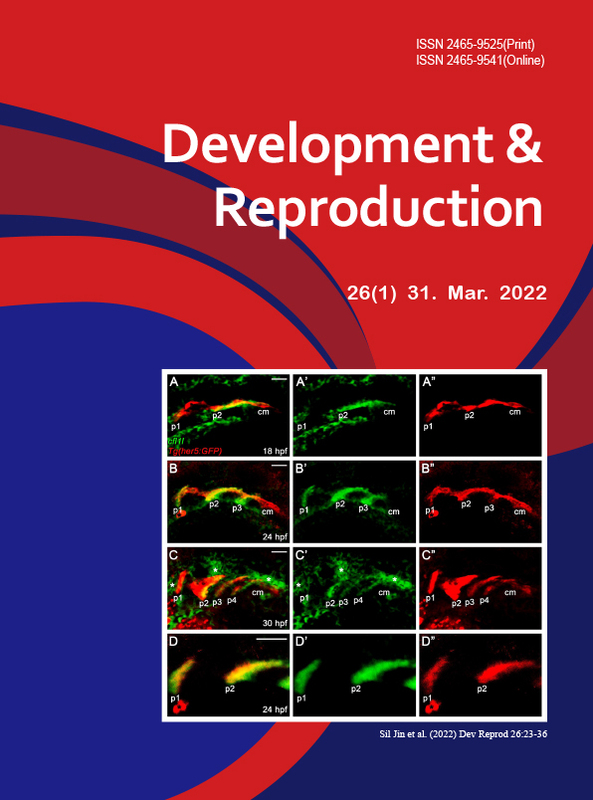 Development & Reproduction (Dev Rerprod) is a primary research journal in the field of developmental biology that aims to promote the original knowledge and research. From its initial launch in 1996 to present day, Development & Reproduction continues to publish principle research articles at the molecular, cellular, histological, and genetic levels across the spectrum of basic and applied sciences – natural science, medical science, fishery science, veterinary sciences and animal husbandary – covering topics ranging from stem cell and competency to evolutionary developmental and system biology, from cytoplasmic events to nuclear events in development, from fertilized egg to cell type specificity, morphogenesis and organogenesis, and from epileptics to developmental maintaining. Original research at the molecular, cellular, and genetic levels. The Korean Society of Developmental Biology was established on June 31, 1995 in Korea by a group of researchers from the natural, medical, veterinary, livestock and fisheries departments. Professor Bae In-ha (1995-1997), Professor Kim Moon-kyu of the second president (1997-1999) and professor Kim Chang-geun of the third president (1999-2000) took office. In 1996, the official publication of the Korean Society of Developmental Biology, Development & Reproduction, was launched. The Korean Society for Development Biology is an incorporated association recognized by the Korean government. The Korean Society for Developmental Biology provides opportunities to cite international papers and publishes steady academic papers.